On the first Saturday night in November 2015, Melbourne multi-instrumentalist Adam Simmons completed the first week of his month-long project, 100:25:1. As on most nights that month, Simmons played duets with four musicians from different backgrounds. With multi-instrumentalist Mal Webb he switched between a six-foot-high Slovakian recorder and a variety of reeds and woodwinds. 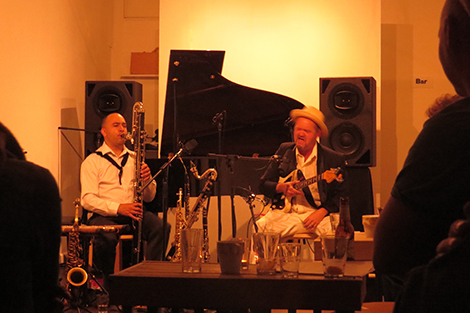 On sax he accompanied Matt Bailey’s moody Wurlitzer ballads, stepping out the front door of the Conduit art space in Fitzroy during one song to play a screaming solo from the street. He wound up the night accompanying Domenico de Clario’s grand piano and introspective prose lyrics. Simmons’ exhaustion was evident, although he had not missed a beat musically. He’d completed 24 duets in six days, and still had 76 to go over the next three weeks. Simmons has been active in Melbourne music for over two decades. Graduating from VCA in 1992, he is often identified as a jazz reeds player, but plays across a range of genres including free improv, rock, blues and world and contemporary art music. His instrumental palette ranges from contrabass clarinet to saxophone to piccolo, and over the past decade he has become adept at the shakuhachi. 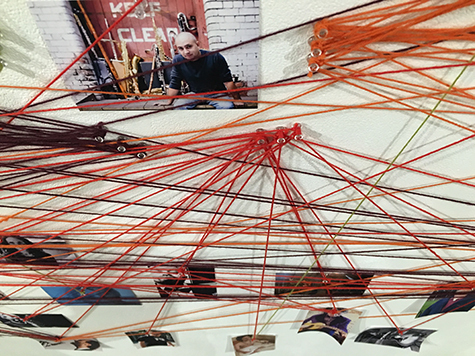 As well as the performative challenge of 100 duets, 100:25:1 involved the musicians as a data source to construct a map of Melbourne music with Simmons as the central node. The impetus for this idea was a conversation with Fitzgerald about the size of respective musicians’ pay packets. “I was astounded at the difference [in our incomes]; at the way he is treated,” Fitzgerald says. Each musician completed a questionnaire including details of their income and who else in the 100 they had played with in the past year. 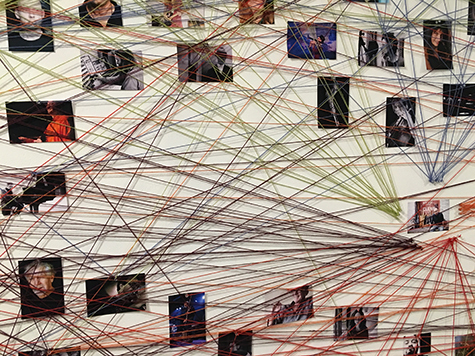 Simmons and Fitzgerald represented these relationships by linking photographs of musicians with coloured yarn on a wall in the performance space. Simmons curated each of the 25 concerts to include not only a diversity of genres, but also performer ages and experiences. Every day he wrote conversational posts on social media about his shared history with each musician. Adam Simmons’ multi-genre skills and shared history with each musician was the lynchpin throughout the month. The musical territory traversed was vast; from Peter Daffy’s yodelling and Pete Lawler’s funky comedic songs to a contrabass clarinet duet with Aviva Endean and a transcendent Byzantine hymn sung by Deborah Kayser. Simmons completed his 100th duet on the last Sunday in November with long-time collaborator, Nick Tsiavos. After a solo performance the following night, the map came down off the wall. Carolyn Connors recalls approaching a weary Simmons after this final duet. “You’re a chameleon,” she said of Simmons’ metamorphic performance over the month. John Fitzgerald will submit a statistical analysis of the data gathered to Music Victoria this year. There are also plans for the map to be digitised to an online platform where it can continue to grow. “It’s a way for the Melbourne music community to say ‘we’re here,’” Fitzgerald says. All 100 performances can be heard here: http://www.100251.com.au/audio/.